Back in 2012 I read a book by Dan Wells called A Night of Blacker Darkness. I read it for one reason and one reason only; vampire bunnies. Now, sadly, the legion of vampire bunnies had to be toned down in the final version, but I knew that they had, at one time, existed. And that was enough for me. A Night of Blacker Darkness has been described as a vampire farce. It chronicles the life and times of one, Mr. Frederick Whithers, a young man out to steal an inheritance. Through dark betrayal, he is arrested before he can actually commit the theft, which seems very unfair, leaving him no choice but to escape from prison and complete the theft for which he has already been imprisoned. As any student of literature knows, the only real way to escape from prison is feet first, in a coffin. Frederick is duly buried and exhumed by a faithful servant. However, the graveyard is not exactly empty when he enacts his miraculous escape from the grave. A coven of vampires become convinced that he is the Great One, a messianic figure in vampiric lore. All of his non-vampiric traits are simply proof of his greatness. Things, believe it or not, get sillier from there. 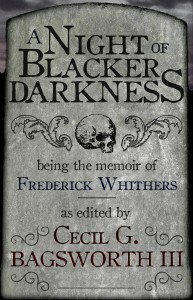 Frederick must enlist the aid of such figures as are about a cemetery at night; namely a poet with a penchant for writing on every available surface and a young lady novelist doing some rather unsettling “research” into reanimation. From there it is a haphazard race to outsmart the bankers, the law, and the vampires, not to mention Frederick’s former partner, in an attempt to secure the inheritance and thus a financially secure future. Now, that’s all very interesting, you might be saying to yourself. But I read this book in 2012. Why am I going on about it now. Well! The book has been adapted for the stage by the Tennessee Wesleyan College Theater Program and it premiers tonight! Sadly, since I have a day job that I should probably go to every now and then, I can’t make it to the opening night, but I will be attending tomorrow night. The TWC is up in Athens, Tennessee, so that makes it right around a 3 hour drive. Totally reasonable for a good vampire farce! I have an extra interest in this show because I got to do a table read of the first scene at the Writing Excuses Retreat last year and given how much fun that was, I can’t imagine that the whole show will be anything less than spectacular. If you’re curious about the process of adapting a novel to a stage show, look no further! Writing Excuses happens to have recorded an episode about that at… you guessed it, the Writing Excuses Retreat last year with Allison Hill and C. Austin Hill from the TWC Theater Program. I’ll let you all know how the show goes next week. In the meantime, I have to figure out what to wear! This play sounds awesome! Wish I could go. I’ll tell you all about it! I’m so excited.